The highly-anticipated "Mrs. Carter Show World Tour" began recently in Belgrade, Serbia, with Beyoncé delivering as dynamic a performance as ever imaginable. Set designer, LeRoy Bennett, was at the helm of the show’s visual display, which ranged from incredible light displays to performer flying and pyro effects. Working closely with Alex Miasnikof and Malcolm Weldon, production managers for the tour, TAIT combined optimized rental assets with custom elements to deliver a complete staging solution. Following opening night, Miasnikof stated: "No matter how complicated or crazy the project, TAIT will come up with a solution. They have a team of great people that will support your efforts in all aspects, from paper to show; no matter where in the world it might be." The rolling mainstage includes a flaggapault lift, retractable dance bar, band risers, duck blinds, propane bars, pantograph stairs, Austrians, Kabukis, Sniffers and fanzone decking with custom handrails. TAIT’s patented Mag Deck system provides efficiency and ease of assembly. Unique in its function, a polished, aluminium dance bar was integrated into the set and rises up onto the stage for performer use. Adding to the array of effects, five propane bar decks, with grating on the top, ignite in flames as the artist performs Naughty Girl. 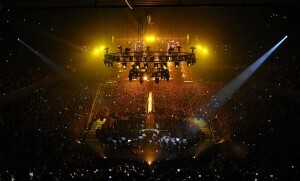 TAIT also crafted the framework for one of the key mainstage elements; a striking strobe and mirror structure measuring 7.3m x 18.2m and made up of five alternating columns of strobes and automated mirrors intermixed with 6 light ladders. The fixtures were provided by Upstaging. TAIT faced and met several design challenges in creating the frame assemblies, which required meticulous engineering and precise alignment to ensure that each light would reflect on its corresponding mirror within the column. Providing one of the most thrilling moments of the show, TAIT uses a flying rig, made up of three T-Winches with two axes of motion, to elevate the artist from the mainstage to the B-stage. The element is controlled by TAIT/FTSI’s renowned Navigator Control System and features a custom foot plate for performer comfort and safety. The B-Stage includes two u-shaped walkways, measuring 1.2m and 1.8m, respectively, in height. The walkways are connected by custom retracting stairs, which provide a unique performance area and wide range of motion for the artist. TAIT incorporated a radial panel of video into the center deck for added visual interest. As the artist performs, a fan situated beneath the stage surface creates a subtle, windblown effect. The centre deck also features modified grating for performer stability. The tour demonstrates TAIT’s proven ability to deliver a cohesive set concept that features both innovative design and incredible automation effects.